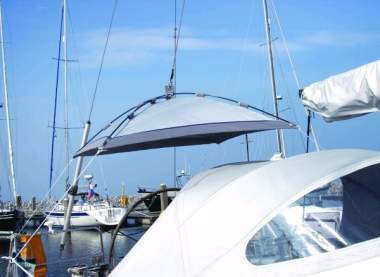 Suspend this sunshade from a halyard anywhere you like on a yacht. Waterproof, ripstop, reflective material provides UV protection. 1 Unpack the sunshade and batten sections. 2 Guide the battens through loops and seat in each corner. 3 Suspend the sunshade from its centre ring with a halyard.